My favourite season of the year is, by far, the fall. I just can’t get enough of that crisp air, the fashion (chunky sweaters, leggings and boots, yes please! 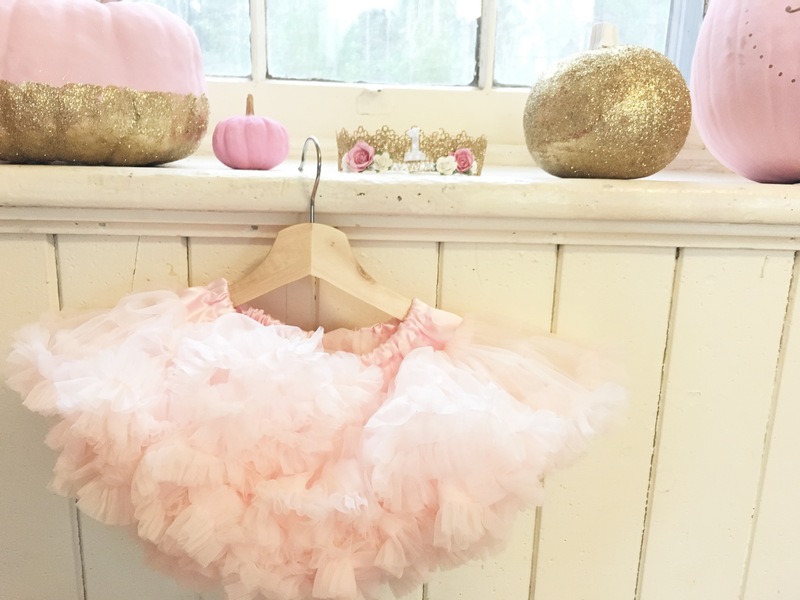 ), pumpkin spice anything and the beautiful fall colours. 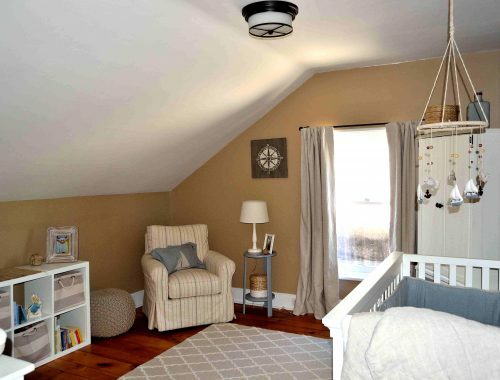 I was so excited when I found out I was pregnant with my second child and knew I was going to have a fall baby. 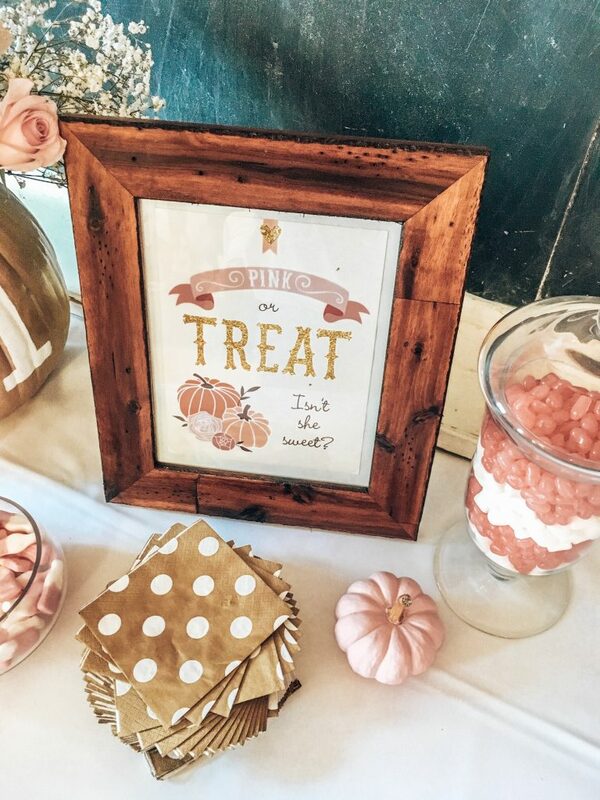 In classic Jodey style, I immediately thought up at least 5 different fall birthday party themes and starting scouring Pinterest for DIY decor ideas. 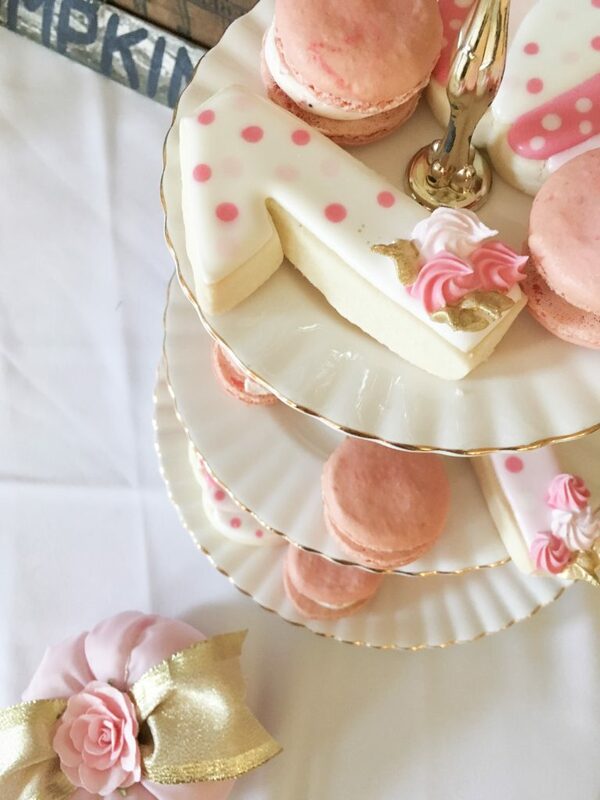 Notwithstanding all that excitement, however, as I started to plan out my daughter’s first birthday party, I couldn’t help but be a little disappointed that it wouldn’t be a pink, floral extravaganza (you know the parties I’m talking about, with gorgeous spring and summer pink flowers everywhere… so pretty!). 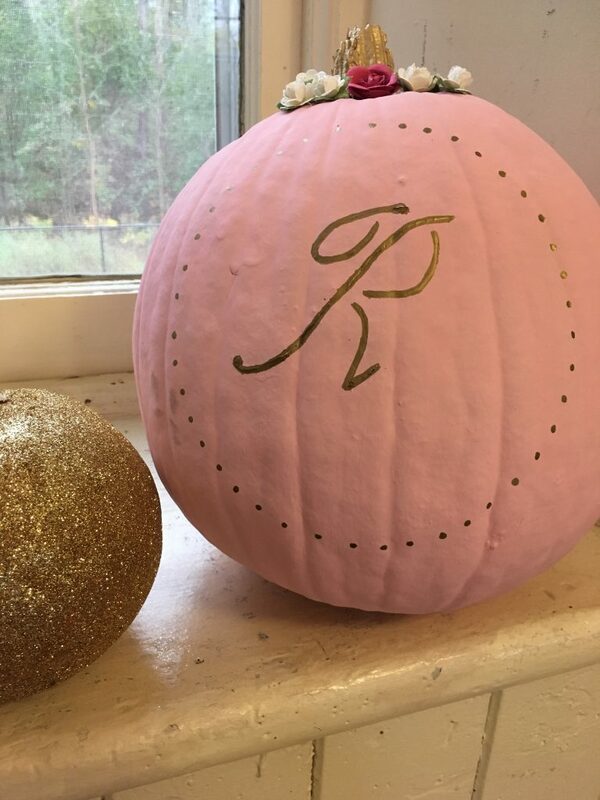 So, I decided to get a little creative with some fall classics, and plan a pink and gold Vintage Pumpkin and Roses Birthday Party fit for our fall wildflower! 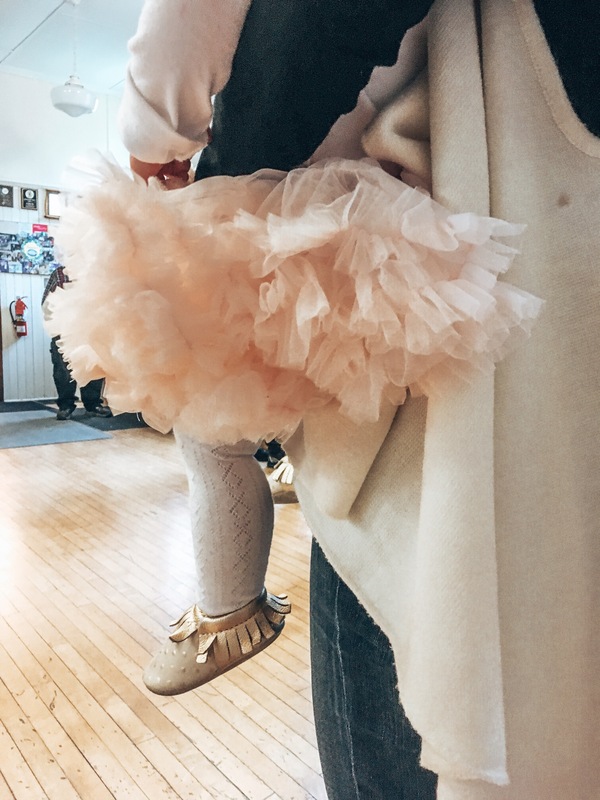 Due to the unpredictability of the weather in mid to late October, I opted to be safe (rather than sorry) and plan an indoor party. 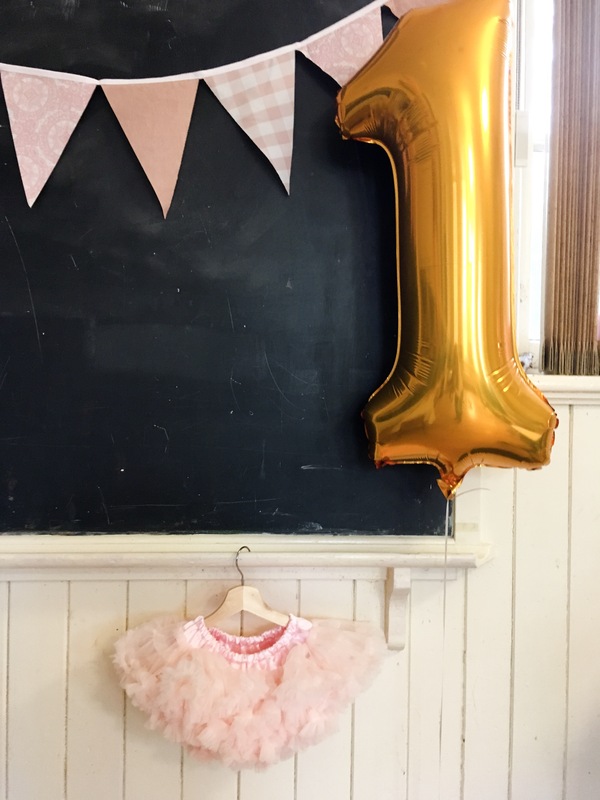 Since our invite list was not short (approximately 50 guests, including littles), however, I did not want to host Reaghan’s first birthday party in our house. 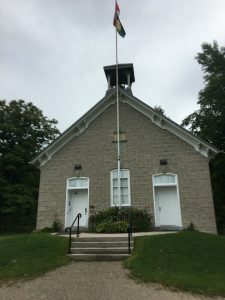 It proved to be very difficult to find a venue that was close by, available, affordable and had some vintage character; I completely lucked out when I popped into this local Community Centre one day while out for a drive at the same time that the caretaker was there and able to show me around. 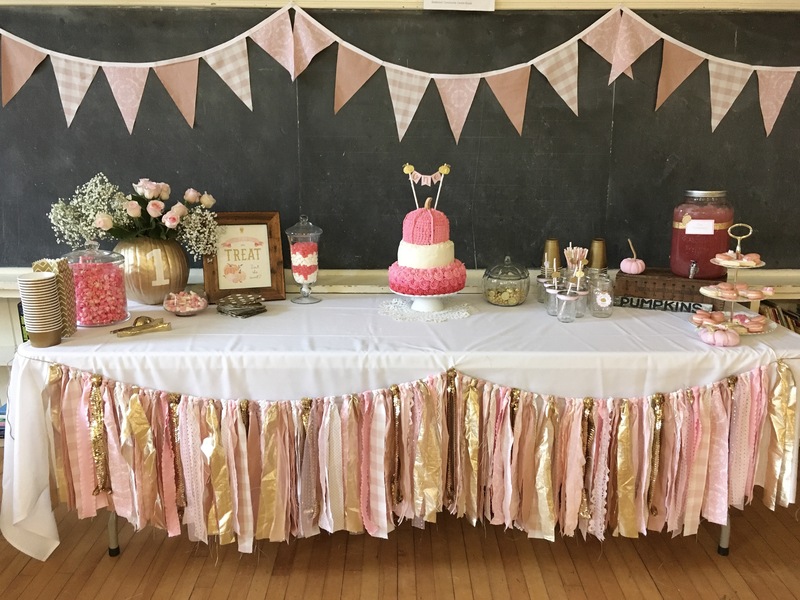 This former schoolhouse was the perfect venue for Reaghan’s birthday party! 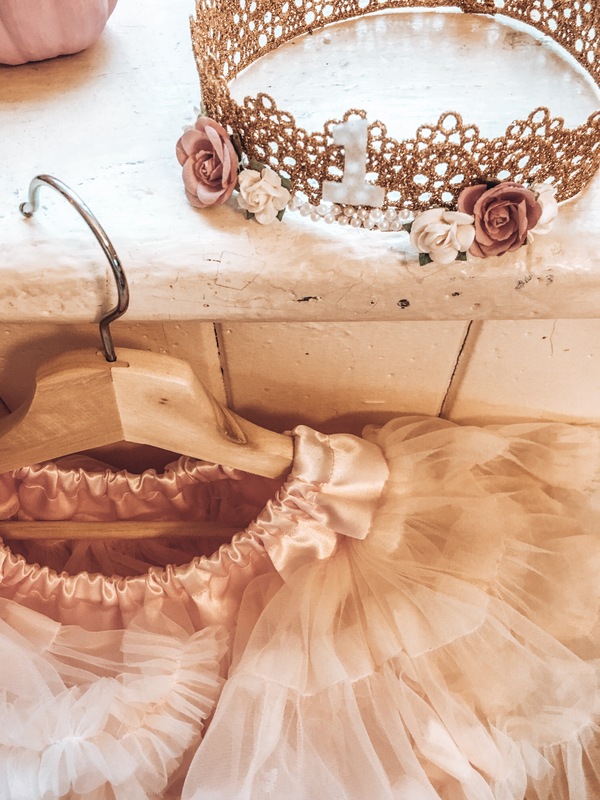 Details about the hand-made DIY crown in the pictures above can be found here and decor details are set out below. 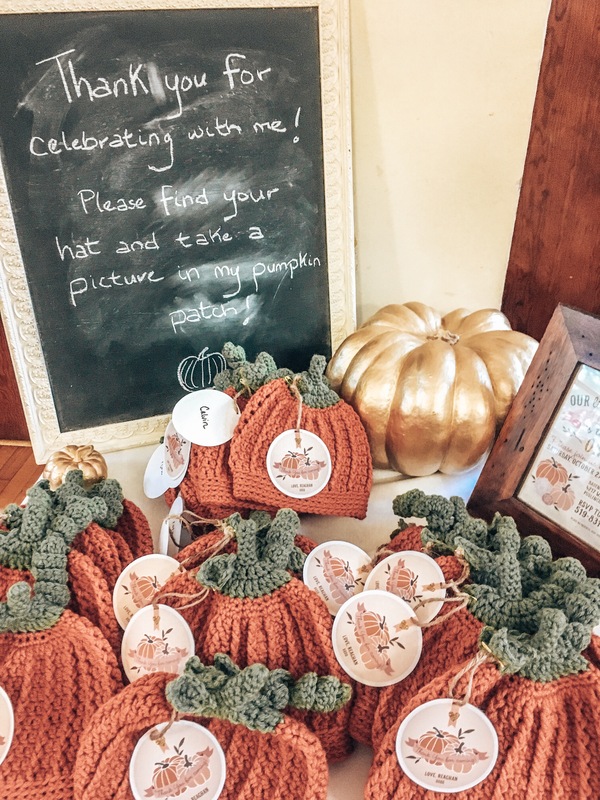 Upon entering the venue, guests were greeted by a table full of custom, hand-made pumpkin hats for the little ones. 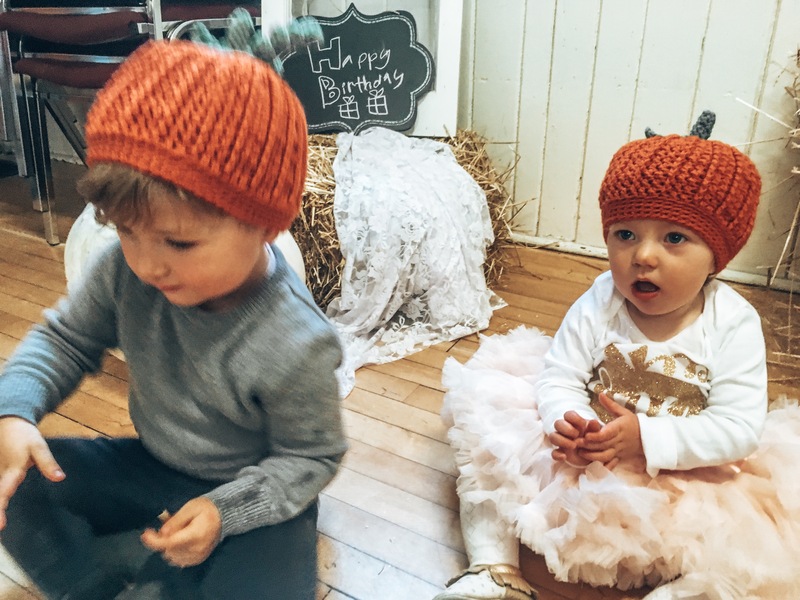 These adorable hats were intended to be worn by guests in the Pumpkin Patch Photo Booth (see below) and doubled as party favours. 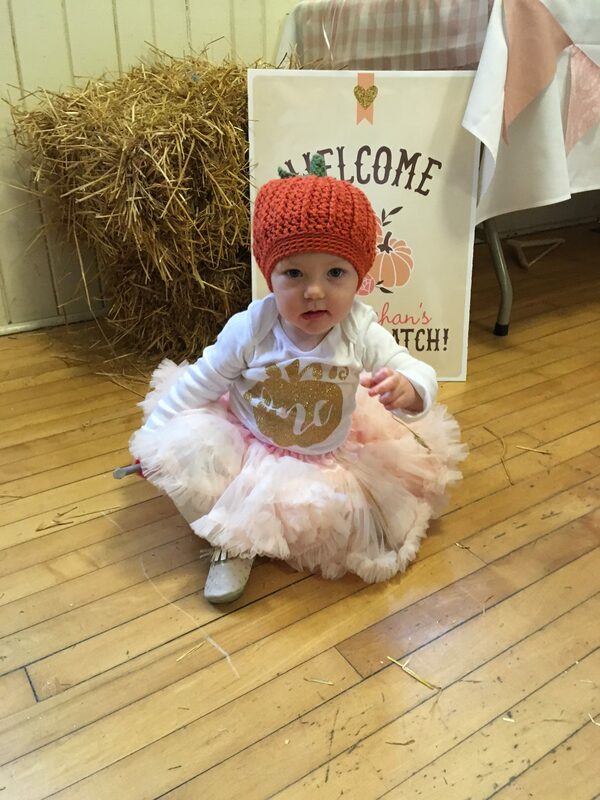 More details about the pumpkin hats can be found here. 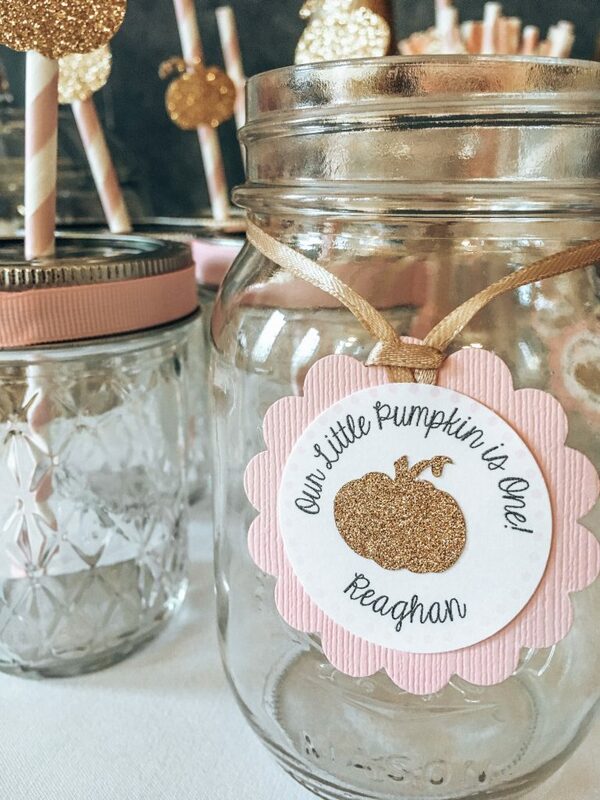 The invitation and favour tags were created by Audrey with Prints For Events. 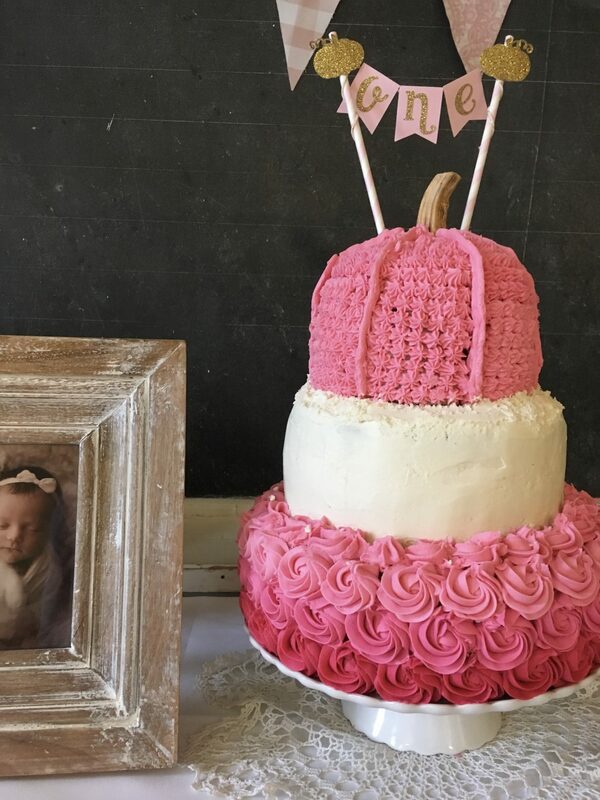 Audrey is super easy to work with and was very helpful with creating a few custom items for Reaghan’s birthday party; I highly recommend her work! 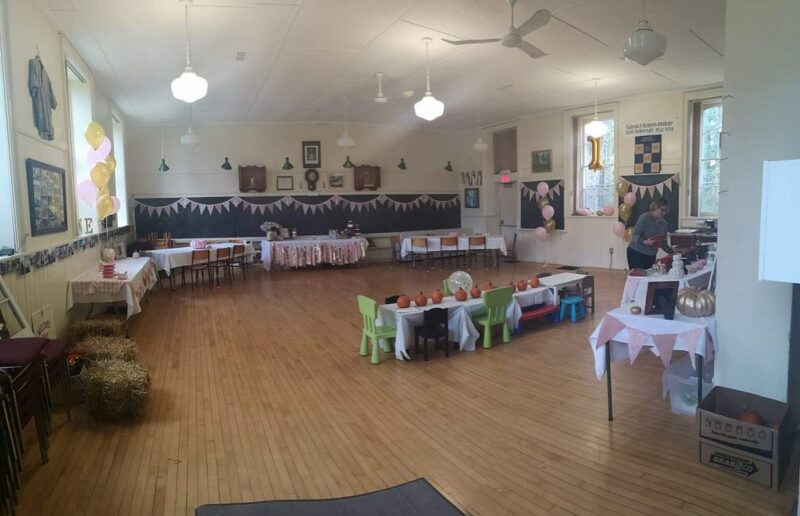 The main food table was set up under one of the eight massive (and gorgeous) original schoolhouse windows. 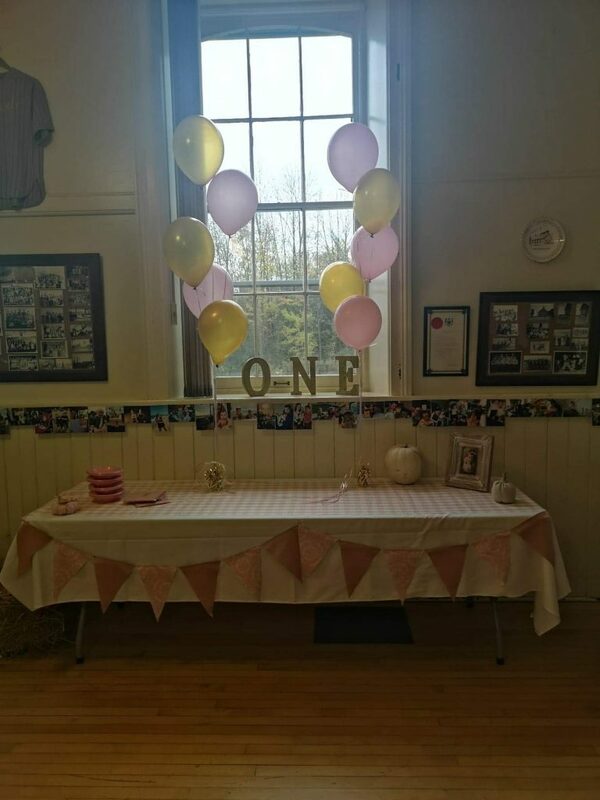 A hand-made fabric pennant banner was hung from the edge of the table to add some character, and gold glittery letters spelling “ONE” were placed above on the window ledge. 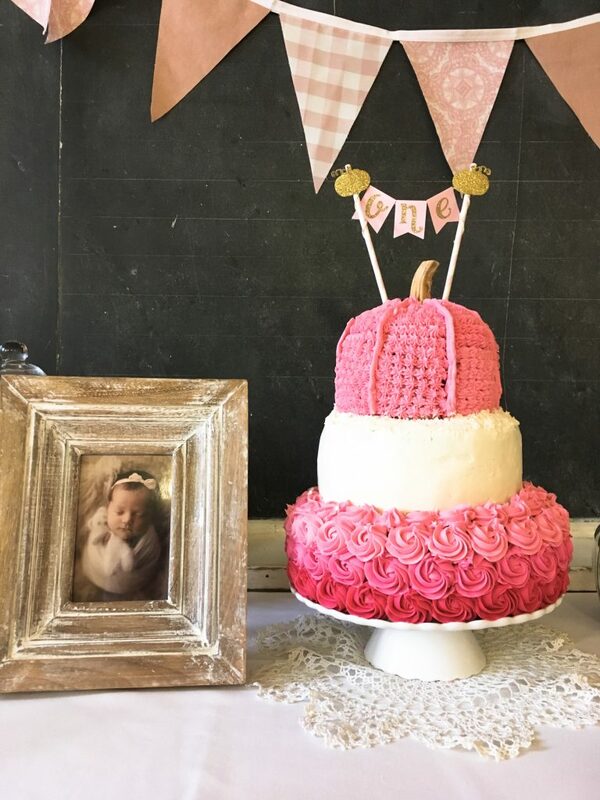 A string of photos of the birthday girl with family and friends was hung above the table and clusters of pink and gold balloons completed the look. Platters of veggies and dip, crackers and fruit were set out during the initial portion of the party. For dinner, guests picked from a variety of classic fall comfort foods, including a crock pot Mac & Cheese (made by my wonderful friend, Sarah), homemade Vegetable Minestrone Soup, homemade Butternut Squash Soup, fresh bread and salads. 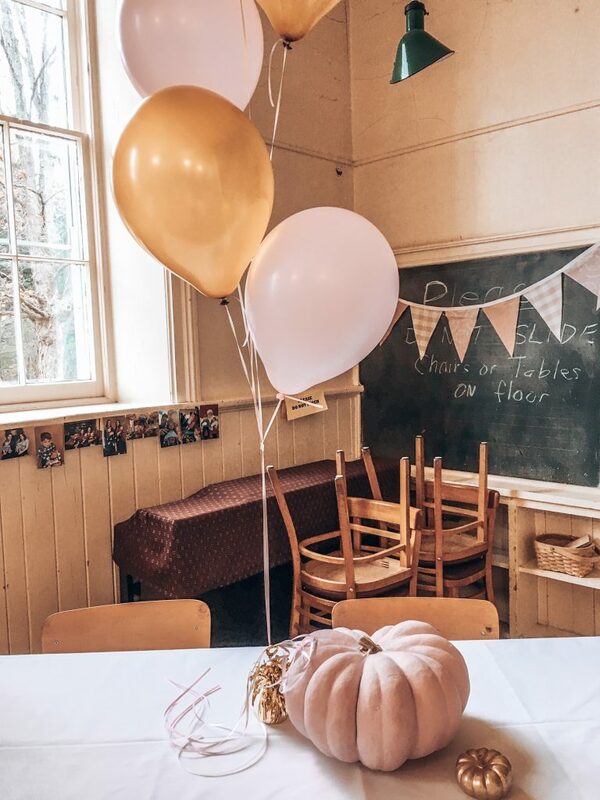 Large tables adorned with painted pumpkins and balloon clusters were set out for guests to relax and enjoy dinner at. 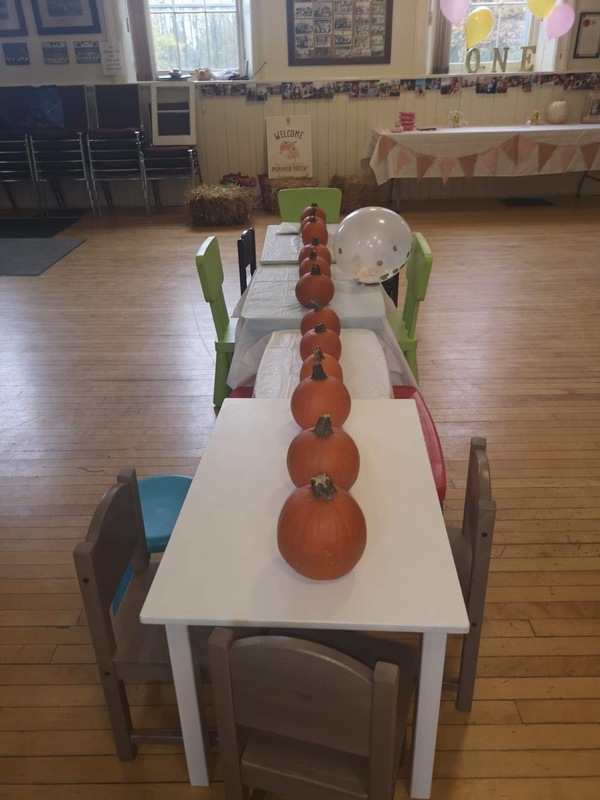 A series of children’s size tables were also set out, which doubled as a craft station at the beginning of the party and a place for little ones to eat later on. 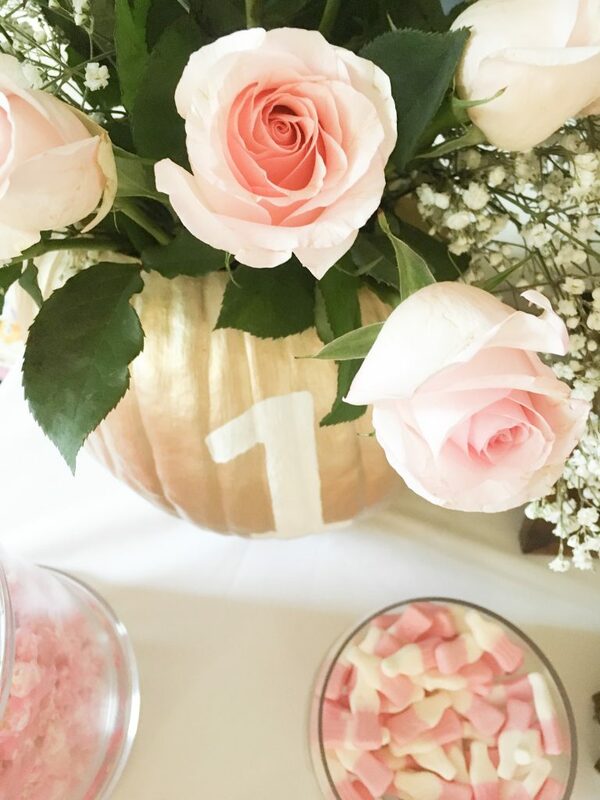 Party activities consisted of decorating small pumpkins, taking pictures in the Pumpkin Patch Photo Booth, running laps around the large, open room and playing with toys and confetti balloons I had brought along. 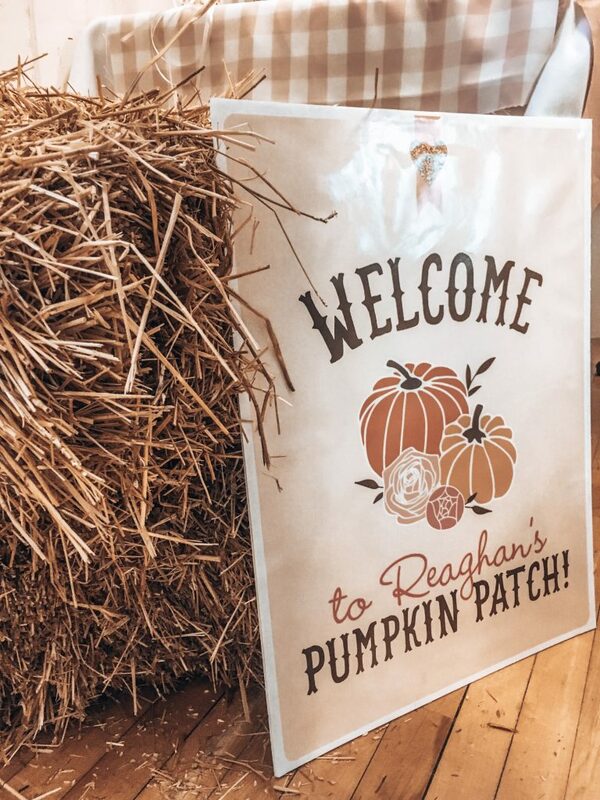 Guests were encouraged to take a picture of their little one(s) in their pumpkin hat(s) in front of the Pumpkin Patch with a Polaroid camera, then place the photo along with a birthday message in a photo album I had left out to function as a nice keepsake for Reaghan! 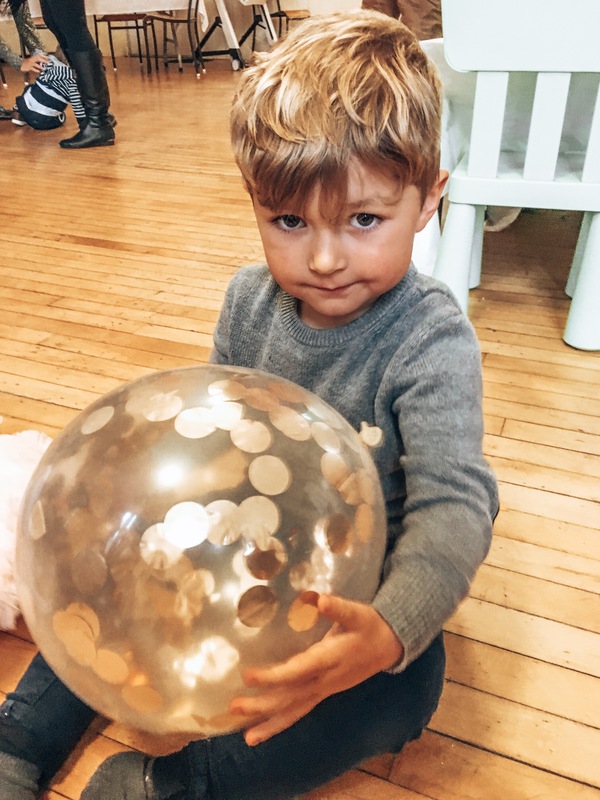 These confetti balloons were a HUGE party hit. 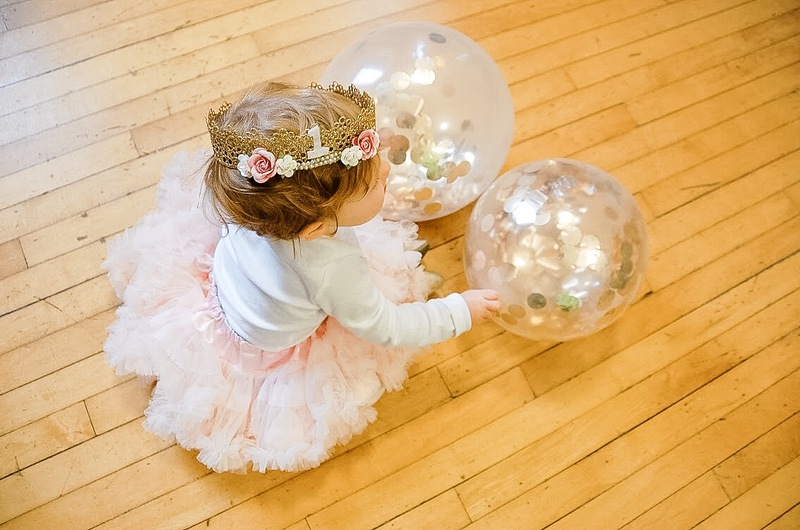 I blew them up and just threw them around the room before the party started, and the kiddos absolutely loved shaking them and throwing them around, watching the confetti dance around inside. These balloons were ordered from Amazon, but I have also seen them in Party City and Michaels. 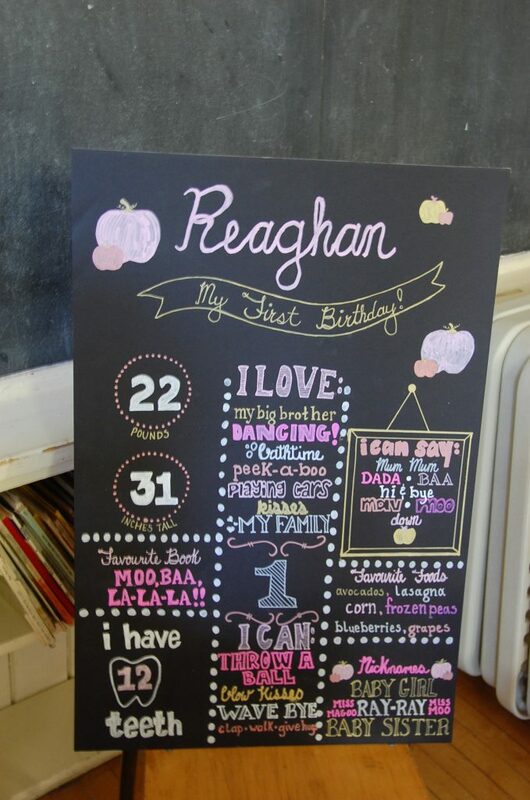 Just as I had made an adorable Milestone Chalkboard for my son’s first birthday party, I knew I wanted to make one for Reaghan’s first birthday party as well. 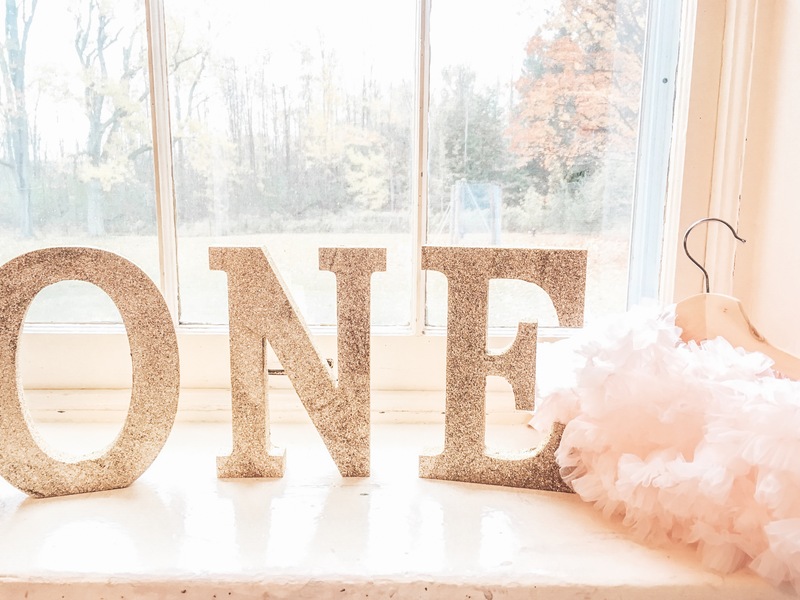 These boards, which are just a piece of black foam board with chalk and metallic marker written on them, are such a great way to showcase baby’s developmental milestones. 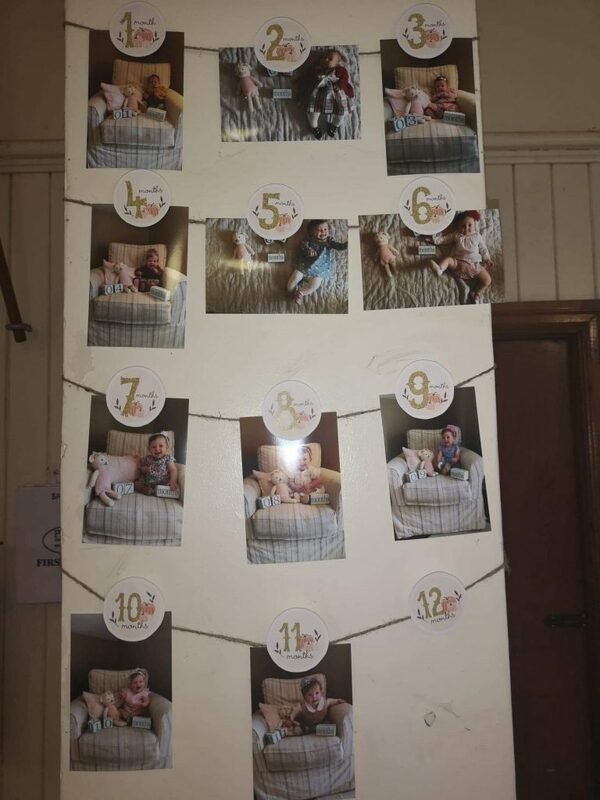 Monthly photos were strung up above the Welcome Table for guests to look at as they entered. Month 12 showed up late as I forgot to print it, so it is missing from this picture! 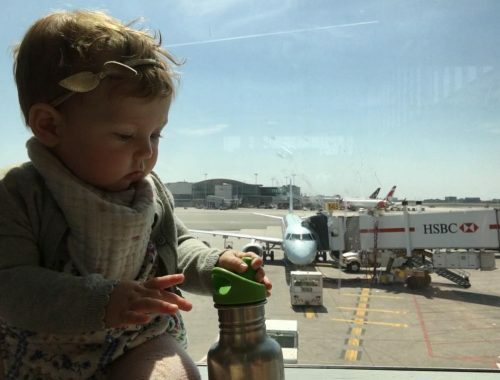 The adorable monthly tags were created by Prints for Events. 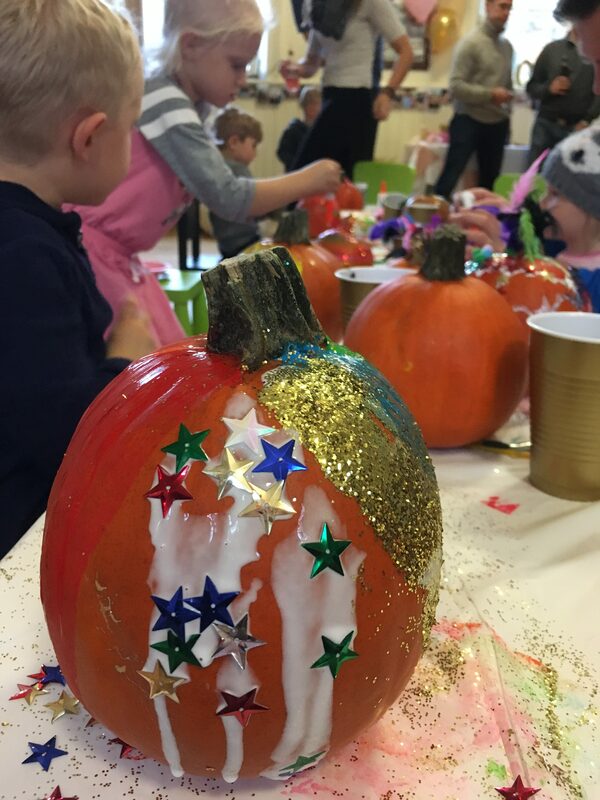 Fully painted pumpkins, pumpkins dipped in sparkles, pumpkins covered in sparkles, pumpkins with calligraphy and material pumpkins hand-sewn by my mom were placed throughout the venue as decor. 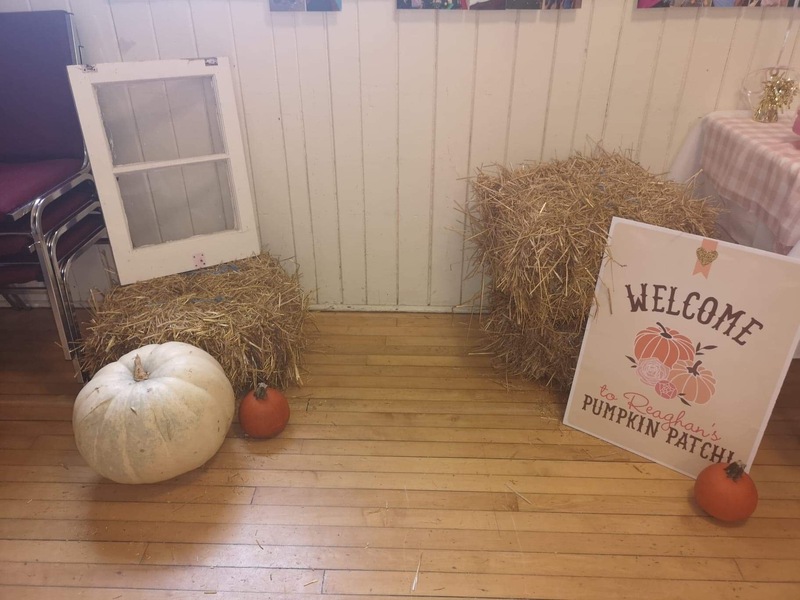 In short, there was a lot of pumpkins!! ! 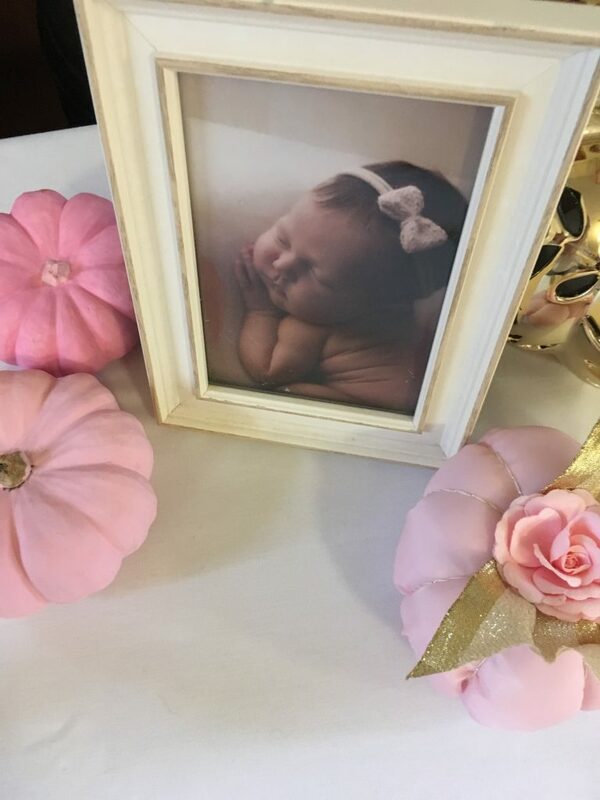 Several of Reaghan’s newborn photos taken by the extraordinary Sandra Hill were set out around the room as well. Sandra took newborn photos of both my littles and I cannot recommend her enough! 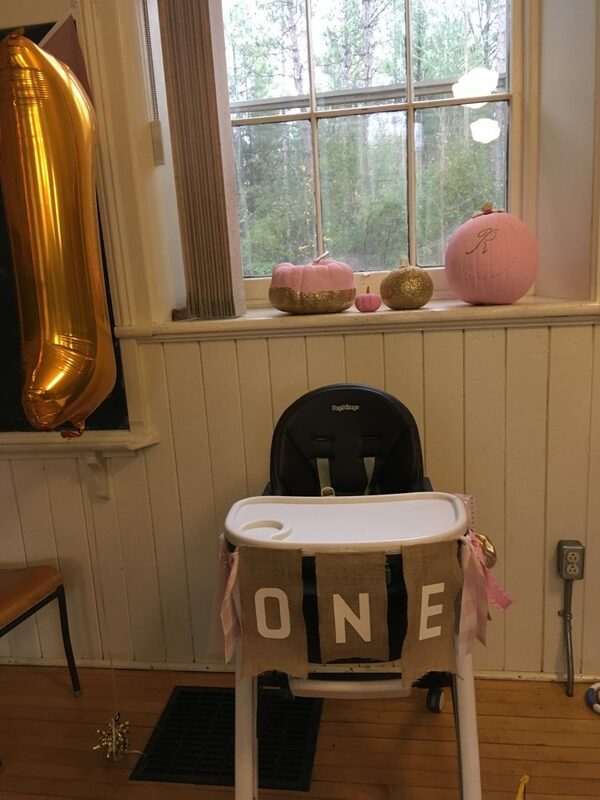 The birthday girl’s chair was adorned with a “ONE” banner (handmade by my mom) and placed under one of the large schoolhouse windows next to a large gold “1” foil balloon, with a variety of pumpkins overhead on the window ledge. 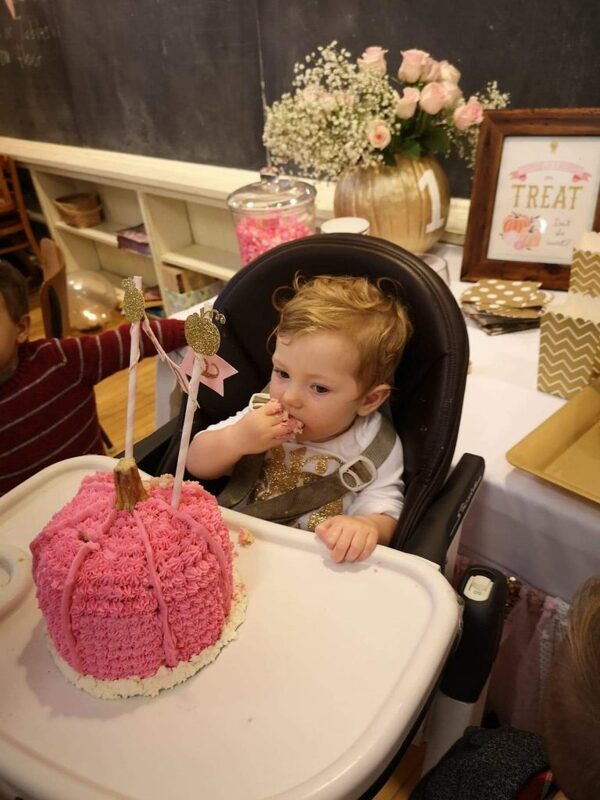 The small pumpkin cake that was the top tier of Reaghan’s birthday cake was a big hit with the birthday girl! 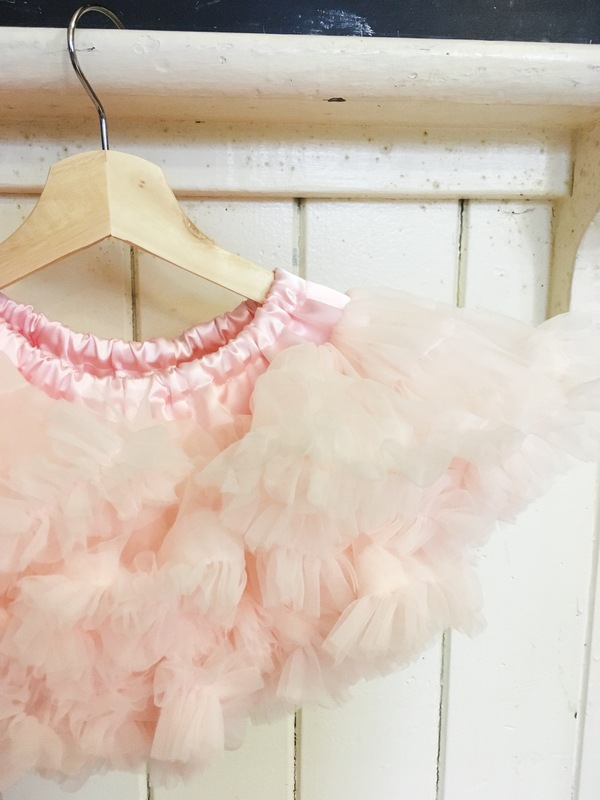 I’m just adding in a couple more pictures of Reaghan’s pettiskirt because it is incredibly adorable and I just can’t get enough of it! 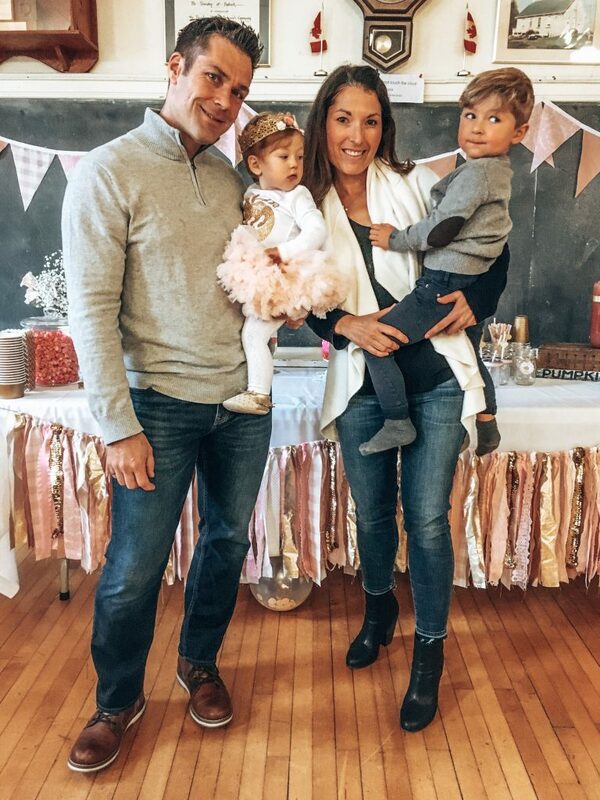 Our family circa 2018, missing our four legged pup, Maverick! 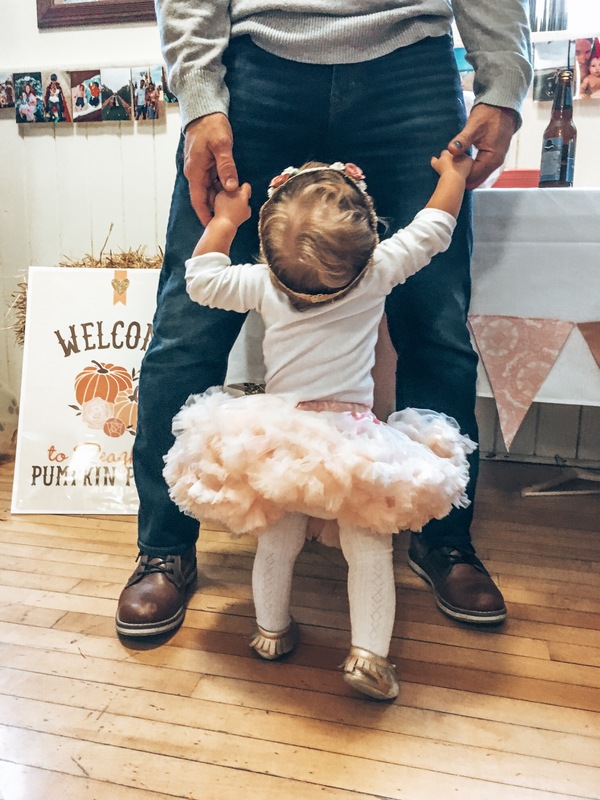 I definitely had a lot of fun planning and throwing Reaghan’s first birthday party, but I could not have done it without the loads of helping hands I had! 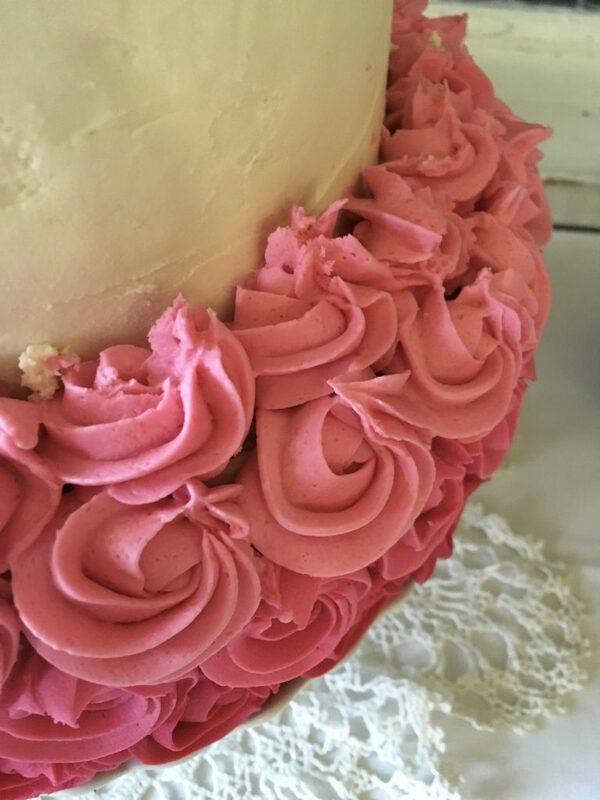 Huge thanks to my own mama (who hand-made loads of the decor items and helped with set up, food prep, clean up and everything in between on the party day). 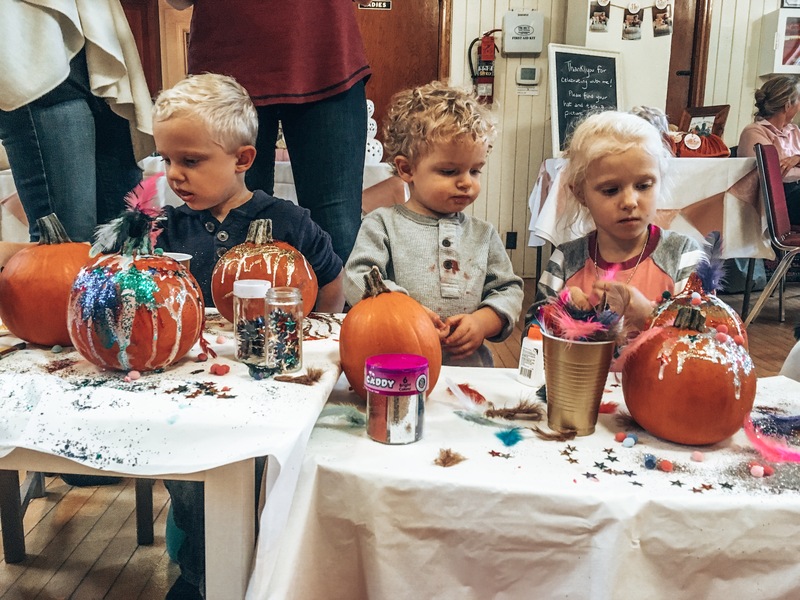 Big thanks as well to the kids nanny, who helped with running errands, painting pumpkins, watching the kiddos and loads of other things that made the party possible. 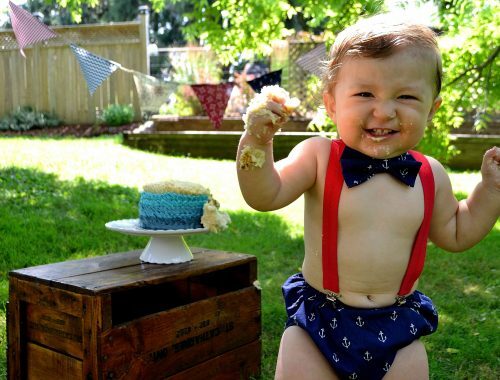 Also, a big thanks to my dad, my husband and my in-laws, all who helped out on the day of the party. 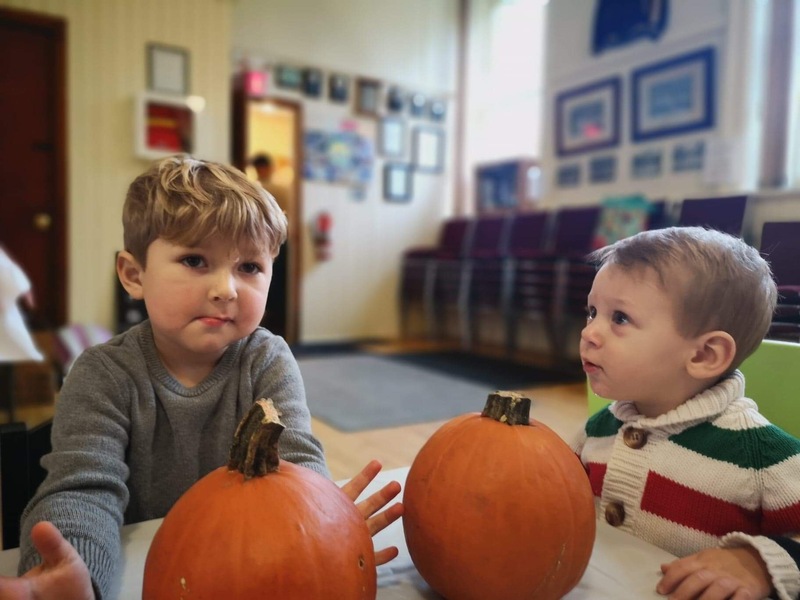 And last, but certainly not least, thanks to my friends Laura (for taking, and editing, all of these wonderful pictures), Anastassija (for all her help with the pumpkin hats) and Sarah (for bringing the yummy Mac & Cheese)!